All that remained after dinner, since we served it immediately. This is about 3 servings here. I’ve had my eye on this Brazilian recipe since I got my Latin American cookbook several years ago, but hadn’t found a chance to make it until last night. It was very popular, though people weren’t quite sure what the difference was until I mentioned the sweet potato was one of the main ingredients in the cake batter. 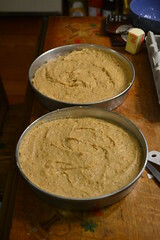 The rest of the batter is primarily eggs and ground walnuts, so it is very rich and moist. Add in the walnut and custard filling and chocolate over the top and you will definitely want to serve this in small slices. Yet somehow with all those rich ingredients it still doesn’t overwhelm your mouth the way many flourless chocolate cakes do. With some gluten-free substitution for the small amount of bread crumbs, this could work well for people with that sort of food restriction. This has almost 3 cups of walnuts in it, given the ground nuts in the batter and the chopped ones in filling, so I was happy to have fresh ones brought back by a friend from her family’s farm in Oregon. A worthy use for them, I think! Cook the sweet potatoes first – in a covered dish in the microwave this takes about 6 minutes, but baking them until soft would probably take up to an hour in the oven. Leave the skins on, cook them until you can prod them and see they’re soft, then let them cool before removing the center and mashing it up for the cake batter. 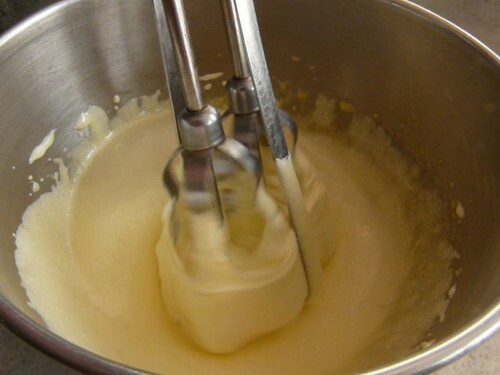 To start on the cake batter, separate the eggs carefully, making sure first sure you’re working with clean, grease-free bowl and beaters for your mixer. 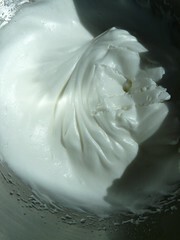 Beat up the egg whites until frothy, then add the 2 tbsp. 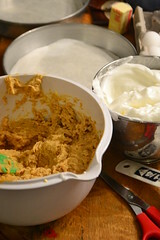 sugar slowly and beat until stiff (they’ll fit in a smaller mixer bowl, but just barely) and set them to the side. Now you don’t have to worry about getting fat on anything else and deflating them before you’re done. Work on the yolks and sugar next, beating them until they are a very light, thick, sticky mixture that has increased in volume. That’s basically the tricky part of this recipe, but if you have a clean mixer and are careful separating the eggs it will be very easy. 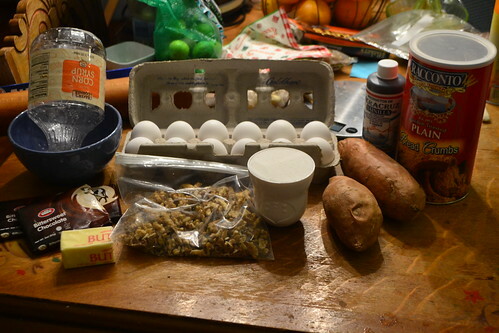 Next, mix the rest of the cake ingredients into the egg yolk sticky mixture: sweet potatoes, vanilla, ground walnuts, and bread crumbs. You should now have two bowls, one with a thick sticky batter and one with the fluffy, stiff egg whites. Mixing these two together without deflating them is just a matter of being gentle – use a spatula and fold them together using a slow, vertical stir that folds the two mixtures together without mashing down all the bubbles in the egg whites. When you have your batter ready, get your pans ready. This is a pretty sticky batter with all those eggs and you want it to come out easily, so butter the pans thoroughly then line them with parchment paper or wax kitchen paper to get them out quickly and neatly. 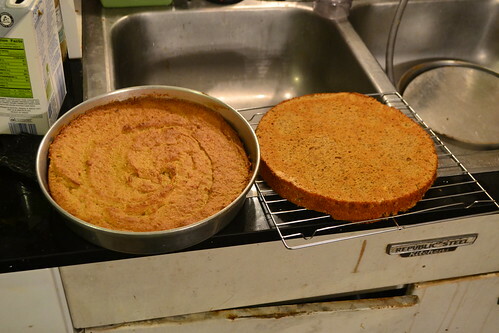 Butter the paper too, so you can remove it from the cake without tearing it up. Spread the batter into the pans as neatly as you can – without any other leavening than the eggs, this won’t rise and smooth out later. Bake at 325 for 40 minutes, then let cool in the pans. Very, very carefully run a thin knife around the edges (the cake tears easily), then remove the cakes from the pans and peel off the paper. Set on wire racks to cool completely. The filling & topping don’t take very long to put together, but you should leave the chocolate glaze until you’re ready to assemble the cake so it will still be soft enough to spread. I don’t have any photos of these steps because I did them quickly while people were finishing up dinner, but I’ve already been asked to make it again for one of my friends soon, so perhaps I’ll come back and illustrate this fully when that happens. Filling: Cook the walnuts in the water and simmer for 5 minutes to let the flavor soak out. 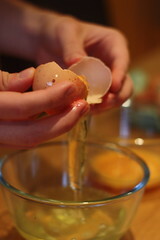 Mix in the egg yolks and sugar and cook, stirring carefully to keep it from burning. 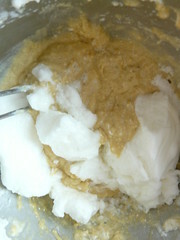 It should thicken rather quickly, but it doesn’t need to be set, just thick enough to spread. Remove from the pan and let it cool. Glaze: When you’re ready to assemble it, carefully melt the butter and chocolate together and stir in the corn syrup – again, keep the heat rather low since this could burn quickly. Assemble the cake and filling on the serving pan, then spread a thin layer of chocolate glaze over the cake. Cut into thin slices (1″ or less, it’s rich!) to serve! Well done! This is such a great bake!